I few years back, I was lucky enough to be apart of a group of friends that wanted to attempt a pop-up restaurant concept. For that opportunity, I came up with a recipe for mini-pavlovas using a chocolate base with coffee. Because it was an Irish theme'd menu, I naturally incorporated Bailey's Whipped Cream and then topped with raspberries. You can have free range for decorating these little guys however you wish. The simplest is a dusting of chocolate shavings. If you want to be ambitious and have the time, temper dark chocolate and create some beautiful toppers. On the show, I made chocolate rolls and placed them between cut raspberries. 2. Chop dark chocolate into small pieces and set aside. Note: If you are using a piping tip for the meringue, do not use a narrow tip and make sure to chop the chocolate up in small enough pieces to push through it! 3. Place egg whites in a stand mixer bowl with a whisk attachment. Whisk until soft peaks form. Slowly add caster sugar one tablespoon at a time and continue to beat until the egg whites become stiff and glossy. Don’t over beat the egg whites or they will separate. When you can hold the mixture upside down without it falling out it’s done. 4. Sift in cocoa powder, add balsamic vinegar, chopped chocolate and coffee. Using a large spoon spatula, mix very slowly and carefully by folding the mixture and egg whites. The mixture will be a light brown shade. Don’t over mix or you will deflate the egg whites. 5. Using a little pavlova mixture, apply on the corners of the parchment paper (same side you drew on) then flip over parchment paper so it’s pencil side down on a baking sheet. 6. Add meringue mixture to a piping bag and pipe into the circles and clean it up with an offset spatula. Make sure you are FILLING them completely when swirling. 7. Place into oven then immediate drop the temperature to 284 F. Cook for 1hr to 1hr 15 minutes. Do not check on the pavlovas until the very end of the bake time. 8. The way to tell when pavlovas are done cooking is when it looks crisp at the edges. They also may slightly brown. The tops will be dry but if you press on the underside it’ll give a little since the centers are still soft and squishy. If you tap them lightly they should also sound a little hollow. If they still feel a bit soft then put them back into the oven for another minute or two. 9. If the pavlovas are crisp, place them back in the oven and leave the door slightly ajar so the pavlovas can cool completely in the oven. Should take another 35 minutes or so. Do NOT remove the pavlovas from the oven before they have finished cooling or they will crack. 10. In the meantime, place whipping cream in a CHILLED stand mixer bowl fitted with a whisk attachment. Start to whisk and when some peaks appear, add sugar slowly. Then add in Bailey’s after sugar. Keep whisking till firm but don’t over whip. 11. Take whipped cream and place into a bowl fitted with plastic wrap and into the fridge until using. Eventually will be piped on each pavlova. 12. Place whipped cream into piping bag and pipe onto pavlova. Then top with two to three raspberries cut side up to ensure juice doesn’t bleed into cream. Garnish with dark chocolate decorations or shavings. I needed to make some vegan gluten free cookies for a girlfriends trip and while I RARELY ever bake vegan let alone gluten free. Thankfully for the internet because it sure did deliver! I was so very pleasantly surprised by the recipe from Minimalist Baker since it was not only delicious but all didn't miss the egg, butter or gluten whatsoever. 1. In a small bowl, mix together flaxseed meal and water. Let it sit for 5 minutes and stir occasionally. This will get very thick almost like an egg white consistency. 2. In a medium bowl or stand mixer bowl, add brown sugar, molasses, almond butter, vegan butter, all spices, salt and baking soda. Begin to mix with a whisk attachment on medium until all ingredients are creamed together. Turn off mixer and scrape down the sides of the bowl. Turn mixer back on and add flaxseed mixture. Mix until incorporated. 3. Remove bowl and add in gluten free pancake/waffle mix. Mix together with a wooden spoon. If the dough is not coming together then add another tablespoon of the flour mixture. Do not over add since it will be too dry and grainy. You want your dough to be thick enough to form a ball. Once dough is ready wrap in plastic wrap and chill in the fridge for at least 1 hour or overnight. 5. Prepare one sheet of parchment paper on your countertop and lightly dust with your flour mix. Place cookie dough on the parchment paper and press down the disc a bit. Dust the top of it with a little more of the flour mix and then place another parchment paper over it. You're going to roll out dough between these two pieces of parchment paper till it's about 1/4 of an inch thick. Don't go too thin or cookies might burn in the oven. 6. At this point if your kitchen is too hot or dough is too soft, transfer the parchment papers to a cookie sheet and place into the freezer for about 5 minutes to re-chill. Or, you can go straight into cutting. 7. Transfer cut cookies on a parchment lined baking sheet. Remember, this dough is VERY SOFT so it can break easily. Use light floured spatulas to move them around or just make sure you work quickly. Place cookies about 1.5 inches apart since they will spread slightly in the oven. 8. Once cut and laid out, put them back into the freezer again for 5 minutes to harden up and reduce spreading when baked. 9. Bake in heated oven for 8-11 minutes. The edges of the cookies should look slightly browner and feel stiff. Cool on the cookie sheet for at least 3 minutes before moving since they will feel very soft. 10. Once they are a bit firmer, move them on a cooling rack to continue cooling to room temp. Enjoy now or store in an air-tight container for 5-7 days. I'm so excited that I had the chance to share my FAVORITE cake recipe with Johnny and Mary on The Great American Baking show! This is actually the cake recipe that I tried out with to get on the show and my GO-TO for my commissions. 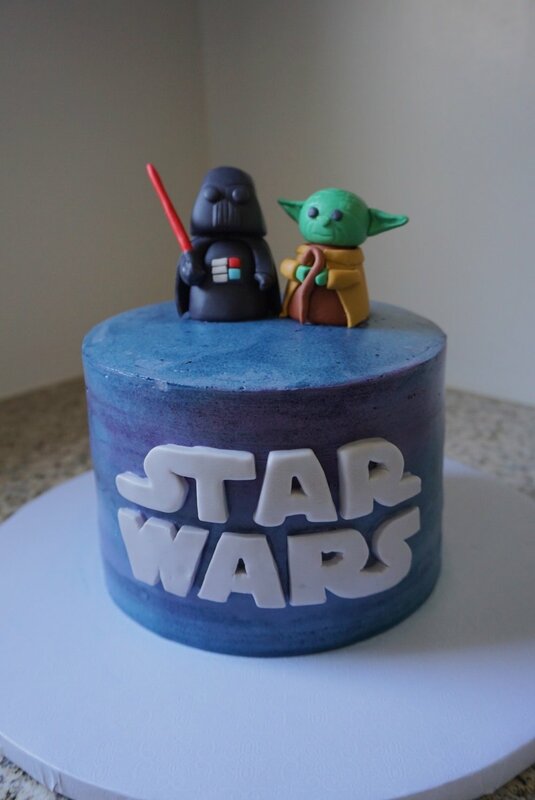 I absolutely love love love this cake. It's not too sweet, full of flavor and pairs so well with a light, airy Swiss Meringue buttercream. It's so easy to make and work with! I've even converted the most non-cake eaters into cake lovers with this recipe! Find the recipe here on ABC's website!